Now in its 9th year, the Scotland Loves Anime Film Festival has been going from strength to strength, with sold-out showings in both Glasgow and Edinburgh, in association with the great Independent cinemas The Glasgow Film Theatre and The Filmhouse. Showcasing both old and new Japanese Anime films, from classics to cutting-edge new releases, the festival has everything on offer for the hardened fan to the casual viewer. With recent Live-action remakes of the classic animes Ghost In the Shell and Death Note, and with Netflix continuing to produce original anime series, the wealth of imagination and innovation that Japanese animation has in its locker continues to leave those who see it in awe. Recent output suggests this is still going strong, with the festival’s line-up this year featuring some titles to look out for. Both the Glasgow and Edinburgh legs feature most of the same new releases, with the Edinburgh leg pushing some older films in an extended programme. Glasgow audiences have the pleasure of seeing the new production by Kazuto Nakazawa, the director of the anime scene in Quentin Tarantino’s wildly popular Kill Bill. Nakazawa is the star guest in Glasgow, and will be present for a Q & A after the screening of the opening episodes of his Netflix original series B: The Beginning. A serial killer supernatural action show about the hunt for a man going by the name Killer B, expect spectacular action sequences, visual pyrotechnics and interesting characterisation. The classic 1990 production Cyber City Oedo 808 is a late night presentation in both legs, and will surely be an audience favourite. Centring on a future in the year 2808, criminals have a choice about how they serve their time, either in jail or as Bounty Hunters with each successful mission reducing their jail time. A cyberpunk action thriller with enough old-school thrills to entertain, here it is presented in the notorious original English dub, with enough swearing to make your Granny blush. Director Mamoru Hosoda has four older films at the Edinburgh leg of the festival, with the most recent being The Boy And The Beast. Specialising in fantastical tales wherein children are drawn into other worlds, Hosoda is one of the biggest names in anime at the moment. The Boy And The Beast is a joyously heart-warming and heart-pumping story of a young runaway who finds himself in a world of beasts and is taken in by the warrior beast Kumatetsu. The relationship of the two is beautifully depicted, and the film grows to an action-packed and touching ending, with Hosoda proving his characterisation and writing is as strong as his visual sense. 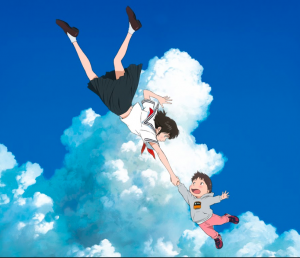 Hosoda’s new film Mirai screens in both legs, and sounds like another transcendent anime from a modern master of the form. Also, screening is Hosoda’s The Girl Who Leapt Through Time, Summer Wars and Wolf Children. Those fans of the original anime film Ghost In the Shell are in for a treat with that films director Mamoru Oshii’s follow up Jin-Roh: The Wolf Brigade showing in Edinburgh, which he wrote and created. A sci-fi dystopian thriller set in an alternate postwar Japan with a hint of Hitchcock, the story focusses on a cop Kazuki Fuse and a young girl who traverse the conflicts of the Tokyo Police and the counter-terrorism unit. A sombre and affecting slice of 90’s anime, with a restrained aesthetic and serious message, it’s one not to miss. For those who like their anime weird and wonderful, director Hiroyasu Ishida’s debut feature Penguin Highway is one to watch. Centring on a young girl and the sudden inexplicable appearance of penguins in her hometown, despite it being far from the sea, the film is a studio Ghibli-esque adventure that revels in the technicolour surrealism of the famous studio, and will surely please a wide audience. Other guests of the festival are Jack Liang, a producer with Polygon pictures, one of the longest running studios, and Jonathan Clements, author of Anime: A History. Whether it be you love the unique action and kinetic visual stylings of picks such as Cyber City Oedo 808 or the multi-layered weird world created by Penguin Highway, the Scotland Loves Anime festival this year will be sure to appeal.